I’ve been told more than once that moving is among one of the most stressful events of your lifetime, right up there with death, disease and divorce. And after having moved five times in as many years, I can tell you with confidence this is true. Aside from all of the technical stresses – as if stuffing all your belongings in boxes isn’t enough – you’ve still got to come to terms with the fact that you are uprooting. It doesn’t matter if you’re only moving from one apartment to another in the same city. You’re still going against instinct, taking yourself from the place you can trust to a new place, a place where you don’t know how many steps it takes to reach the bathroom or exactly where the light switch is on the wall. It was amongst this chaos not long ago that I realized I was beginning to crack. My belongings, all of the physical stuff I associate with who I am, were out of sight, rendered insignificant under layers of cardboard and bubble wrap. I hadn’t really slept in weeks, and my pots and pans had been packed up long ago, making it impossible to sauté my troubles away. The move happened, and here I am, settled into my nice new apartment. But I still feel off-kilter, out of sorts, and a little bit depressed. Because I think it’s during these periods in life, when everything you thought was stable is shaking, that you start to feel disembodied from yourself. The simplest things, like bending to tie your shoes or making a pot of coffee, seem foreign and complicated. You look at yourself in the mirror and see someone you only sort of recognize. You’ve been stirred out of your comfort zone, and once that happens, it takes a long, long time to find it again. And even then, it can’t be the same as it was. But sometimes, even with all of this madness swirling around you, beautiful things happen. You start to learn a little more about yourself. You learn to gauge your strengths and weaknesses. You figure out who you can really trust. Things that seemed significant in your life are no longer so. Your priorities change, and so do you. And sometimes, you learn to take the old and turn it into something new. You learn that, say, if you happen to have an inexplicable surplus of both pork chops and blue cheese in your fridge just three days before you move, all you have to do is put them together, and a powerful union is formed. 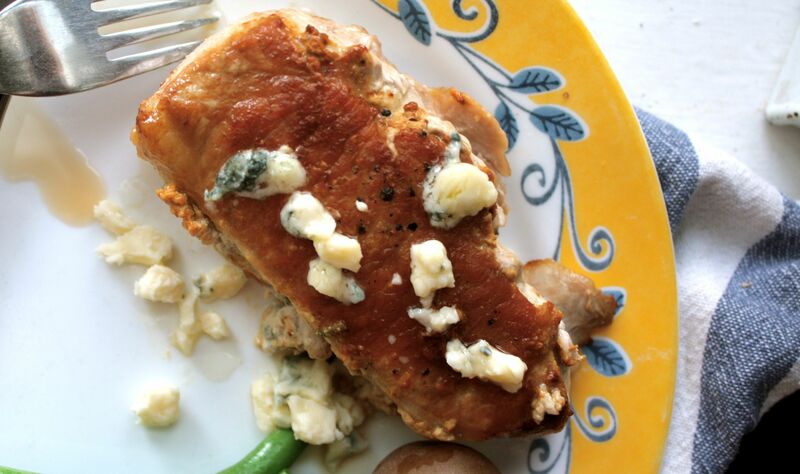 The rich, elegant taste of salty blue cheese champions anything you put on the table, so try and pair your pork chops with simple, mild sides, such as boiled new potatoes and fresh green beans. 2. In a small bowl, combine butter and blue cheese. 3. 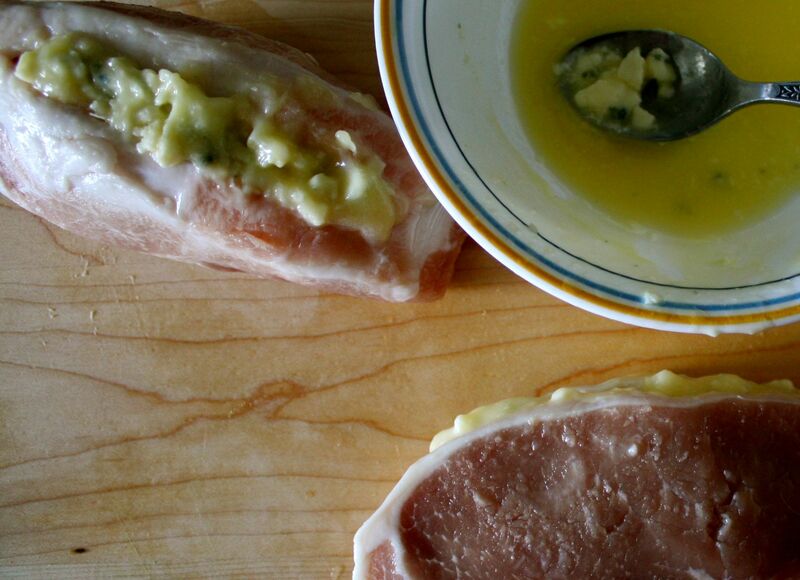 With a sharp knife, carefully cut a lengthwise incision in each pork chop to form a deep pocket. 4. Spoon blue cheese mixture into each pocket, dividing evenly. Gently press pocket together to seal. Season both sides of pork with salt and pepper. 5. Heat a large oven-proof skillet on medium-high. Add oil, swirling to coat. Add pork chops and cook, turning once, until golden brown and a nice crust forms, 6 to 8 minutes. 6. Transfer skillet to oven and bake until pork is cooked through and juices run clear, 15 to 20 minutes. If desired, garnish with additional blue cheese and drizzle with any pan juices.